Greetings from our first Friday Feast for 2012! And what a great year it’s going to be with a fantastic line up of guest authors interspersed with the occasional ramble from me. This week I’m delighted to welcome paranormal and fantasy romance author Shona Husk to the series, and not just because of the drool-worthy recipe she’s about to share. Shona’s August 2011 release, The Goblin King, the first in a paranormal romance trilogy about cursed Celtic heroes and their struggle to be free of the Shadowlands, has been generating loads of buzz in romance land, with good reason. Everyone I know who’s read it, loves it and I’m very much looking forward to getting stuck into my copy. Were-lion Lachlan Garvey is closing in on the Brightwater women, the last of a Shamanic line that the Council wants eradicated for their murderous use of magic. One minute he’s in his animal form, examining a dead body in a patch of charred grass. The next, he wakes up human – naked, shot, and lying in a circle of his own blood. Trapped in the path of a deadly magical fire, Lachlan has to think fast–and talk faster–to convince the beautiful Shaman he’s innocent. As the roaring flames creep closer, Dayna must choose. Trust Lachlan and use magic to save them both…or flee. And live with the knowledge she caused his death, proving that no Brightwater is capable of love. Warning: Contains a naked hero who’ll do anything to save his life…including saving hers. Sounds awesome, doesn’t it? Well, it’s available for pre-order direct from the publisher and on Kindle, so start clicking! Anyway, enough from me. Take it away, Shona. I love to cook, especially if it involves chocolate. Ice cream, brownies, cookies. Yum. Of course my family reaps the benefit of these tasty treats. The best part of this recipe is that it’s all done in 1 pot and you don’t need beaters, so there’s very little mess. If you don’t like chocolate, or calories, look away now. Line a rectangular cake pan/lamington pan (33 x 23cm) with baking paper. Melt butter and chocolate in a medium saucepan over low heat until melted. Stir in sugar, eggs and vanilla. Add 125g chopped Toblerone and pour mixture into cake pan. Bake approximately 20-30 minutes. If you like them fudgy 20 mins, or if you like them cakey 30 mins (I always go for fudgy so they are squishy in the middle). Take out of oven. Sprinkle with chopped extra Toblerone and press into brownies—gently. These will keep in the fridge for four days…maybe longer but I’ve never had the chance to find out as they get eaten too fast. Because Brightwater Blood is set in Margret River I thought I should offer a wine selection to go with the brownies. I’m not much of a port drinker but hubby recommends Gralyn Cellars White Port. Phew! Now that’s what I call an indulgent recipe. Thanks, Shona. I think I’m going to test this out on my niece and nephews when they come to visit. That way I’ll get to try a slice while remaining safe in the knowledge there won’t be any leftovers for me to scoff. If you’d like to learn more about Shona and her wonderful paranormal and fantasy romances, please visit her website. You can also keep in touch with Shona via Facebook, Twitter and Goodreads. All this chocolate has given me severe cravings, but seeing as I’m trying to be good at the moment – boring, I know – I have to live vicariously through others so would love to hear about your favourite chocolate indulgence. Come on, fess up. I’m sure you have plenty! This entry was posted in Friday Feast and tagged Australian Writers, ebooks, Food, Friday Feast, Kindle, Recipes, Shona Husk on January 20, 2012 by cathrynhein. Oh…my…god…I love toblerones and cake….that looks so horribly wonderful. I must make that. I know! Isn’t it just luscious? As if Toblerones weren’t yumptious enough on their own. Thanks for popping by and commenting, Roxanlita. And good luck with that baking. Toblerone cake? Omigod, omigod, omigod… Have to make it!! As a fellow food blogger, I salute you! That’s exactly my reaction when I saw Shona’s post, ayoungfoodie. MUST MAKE! I’m also really keen to try the white chocolate and raspberry version Shona mentioned. Mmmmm. The raspberry version is adding ½ cup of frozen raspberries (I think, I used too many last time and is was delish but squishy) and ½ cup of white choc bits instead of the 125g of chopped chocolate—and no choc pressed on top. A fab new author to read while I sit and indulge in a new receipe – Toblerone Brownies. I can’t think of anything better. Imagine reading a fab newly discovered author while eating Toblerone brownies, relaxed in a squishy chair in some cosy, quiet niche with a nice cuppa close at hand. Talk about bliss! Thanks for dropping by, Bron. You’ve given me lazy ideas! OMG love it- going to try it! 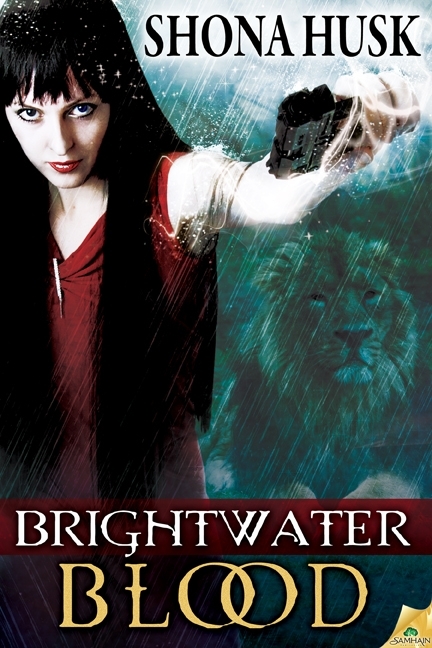 P.S thanks for the wonderful Goblin King- read it in one day- loved it have pre-ordered Brightwater blood- can’t wait! Can’t help feeling jealous that you’ve already read The Goblin King, Karly. I’ve heard such wonderful things and read-in-a-day is one of the best endorsements. I think everyone’s going to be baking Toblerone brownies. How can we not! Glad you liked the Goblin King! You have, Shona. You have! Thanks for the raspberry and white chocolate quantities. Will be having a go at that treat. Sounds to die for. Ooooh, Shona, definitely something dangerous. We’re all running for our kitchens to make it. And sounds like it will be great to eat while we read your books. All your books sound fantastic and can’t wait to read them. Dangerous but oooooh so good, Suzi! Ha ha! Yup. That about sums it up. Thanks for dropping by, Keziah. Lovely to see you here again. Oh, look, I’m sorry, but this is evil! Eeeevillllll! Toblerone is bad enough, brownies are bad enough, but together, Eeeevillllll! How on earth is a girl supposed to concentrate on her writing, let alone watch her diet? They are a terrible new evil designed to break New Year’s resolutions with a single bite. Mwahahaha. My good food behaviour quest flew out the window today with your absolutely delicious butterscotch, Ms Gracie. Bad, baaaad woman! Thank goodness Jim’s taken a liking to it too otherwise I’d be scoffing it all myself. I think everyone’s suffering diet distress after seeing this recipe, Aretha. Temptation indeed! Shona’s books are just as luscious. You must try them. You won’t be disappointed. I love brownies they are one of my favourite things to cook. Those brownies sound perfectly divine…in a very evil way : ) Yum! I’m laughing at everyone’s comments. I bet you’re all as boggle-eyed as I was when I first saw Shona’s recipe. I thought hard about making these brownies today but I don’t know if my niece and nephews are turning up next week or not, and I’m not about to risk leftovers! Thanks for popping by, Mel. I bet your boys would LOVE this, Rach. I’m very keen to try the white chocolate version. It sounds delicious, and so easy! How divine! 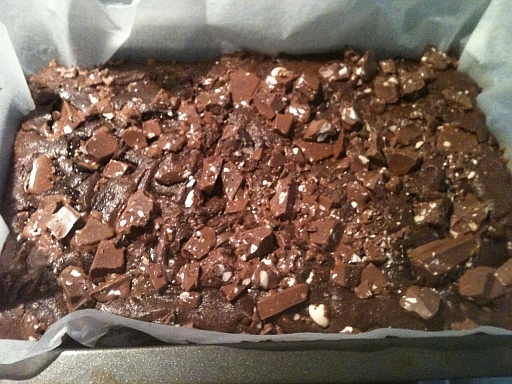 Toblerone Brownies are going to blow any diet out of the water, but what a way to go!!! Although the raspberry version sounds like the perfect way to include three food groups in one hit 😉 so that makes them legit, right? Love Celtic heroes so I’ll have to add Goblin King and Brightwater Blood to my TBR pile. The only thing better than a Celtic hero is a tortured Celtic hero 🙂 enjoy. Thanks for dropping by, Helene. Lovely to see you. And I agree, the raspberry version sounds positively healthy! No excuse not to make it. Enjoy your Celtic heroes. Which reminds me, I already have The Goblin King but must add Brightwater Blood to my shopping list. I just put on 5kgs LOOKING at that picture of the Toblerone brownies, Shona & Cath. 🙁 Not sure if I should add it to my recipe book or not – sigh. I’ve zipped over to the Book Depos. to order THE GOBLIN KING, Shona. As part of my DarkSider Reading Challenge, you’re on the list to read – just have to get this deadline for my 3rd book out of the way and I’m burying myself in my TBR pile and not surfacing until I’ve completed a good binge!!! 🙂 Catch up time! I’ve learned that I’m always on a deadline so I make time to read for 30mins a day regardless. Sometimes that break is just what I need to get going again. That’s going to be my strategy – only make when there are guaranteed visitors. It’s just far too risky otherwise. I haven’t had a book binge for ages, Kylie. Like Shona, I have a time set aside each day for reading. Trouble is, the size of my to-be-read pile tells me I need much more than that. Would help if I stopped buying books but that’s just a silly idea! Thank you, I’ve just been searching for information approximately this topic for a long time and yours is the greatest I have came upon so far. However, what about the conclusion? Are you positive about the source?